Montenegro means, “Black Mountain.” The name is fitting, as much of the land is covered with dark, mountain forests that appear black from a distance. This small, Balkan country located in southeastern Europe has many neighbors: Serbia to the northeast, Kosovo to the east, Albania to the southeast, Croatia to the west and Bosnia and Herzegovina to the northwest. Montenegro also has a magnificent border along the Adriatic coastline which boasts 117 beautiful beaches and several charmed island villages. Montenegro has recently been listed as the hottest new tourist destination on many top travel sites. The country features many outdoor activities and about 60 percent of it is more than 1000 meters (3,280 feet) above sea level. Winter snow sports, such as skiing and snowboarding, are very popular, along with climbing, in the warmer months. The mountains include some of the most rugged terrain in all of Europe. Of course all water sports are available along the beautiful Adriatic Sea, along with white water rafting in the clean and glorious rivers including through the breathtaking, Tara Canyon, the second deepest in the world, after the Grand Canyon. Montenegro has a rich history, dating back to the Iron Age, when the Illyrians were the first known people to inhabit the region. By 1000 BC, the Illyrian culture had spread across most of the Balkan region. The Romans came next and established the Province of Dalmatia, which included what is now Montenegro. The most important Roman town in the region was Doclea, where archeological finds indicate it was a central area for trade. At the decline of the Roman Empire, Montenegro was on the dividing line between the Roman Empire and the Byzantine Empire and was therefore split. After many battles and changes of rule and power, large portions of the region fell under the control of the Ottoman Empire. It remained under the Ottomans from 1496 to 1878, although Montenegro had a unique autonomy with the Ottoman Empire. A battle occurred on May 1, 1858, when a Montenegrin army of 7,500 defeated over 15,000 Ottomans. This forced Montenegro’s independence in 1878, although only briefly. This important victory is immortalized in song and literature. During World War I, Montenegro was occupied by Austria-Hungary and then became part of Yugoslavia. After the dissolution of Yugoslavia and much turmoil in the region, Serbia and Montenegro formed a union under the Belgrade Agreement. This agreement allowed for a referendum on the independence of Montenegro in three years. On May 21, 2006, a vote for independence was held resulting in a 55% threshold, which narrowly passed by a mere 2300 votes. It is this date in May that is celebrated as the new Independence Day in Montenegro. The official language there is Montenegrin, which is the same name they call the people. Serbian, Bosnian, Croatian and Albanian are also spoken. The population is diverse and a mix of all the neighboring countries, with the majority being Montenegrin and Serbian. 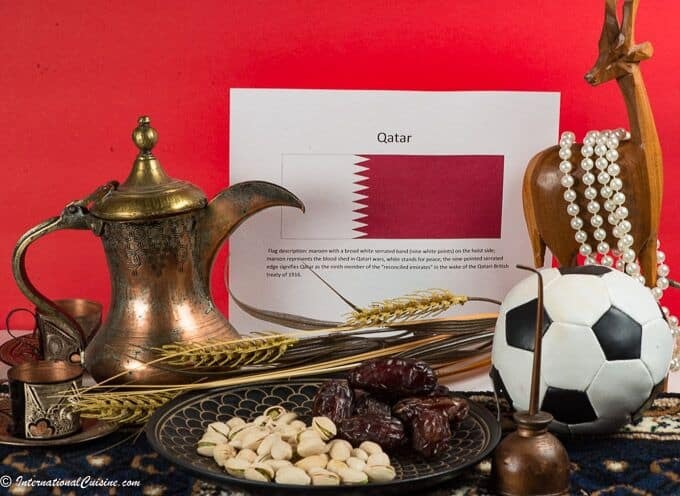 Tourism, steel and aluminum production and food processing, represent the countries major industries. Serbian Orthodox Christianity is the most popular religion today, however Muslim is second, followed by Albanian Catholics. Religious institutions have guaranteed rights and are separate from the state. Its crossroads of diversity over the centuries have allowed for a unique and peaceful existence between Muslim and Christian people. Montenegro has numerous heritage sites, ranging from the pre-Romanesque, Gothic to the Baroque periods. The coastal region is known for its many religious monuments. It is home to medieval monasteries, with walls that are decorated with thousands of square meters of frescos. Montenegro’s largest city and capital is Podgorica. Along with the former royal capital, Centinje, these are two very important city centers for both culture and art. Montenegro was the first country in the world to have a national printing house that was set up in Cetinje, back in 1493. The equipment was brought in from Venetia. The first south Slavic book was printed in 1494 (Oktoih.) Several medieval manuscripts, dating from the 13th century, are housed in Montenegrin monasteries. As we look into the cuisine of Montenegro, it is largely influenced by region and by history, making for a delicious combination. 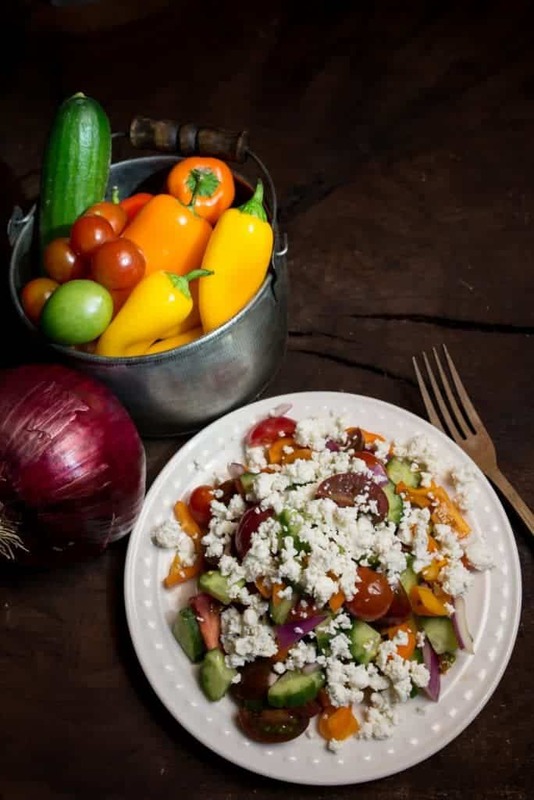 Generally speaking, the food has an emphasis on fresh, local vegetables, quality meat and seafood and of course, features the amazing olive oil for which the region is known. Influences come from Turkish, Greek and Italian cuisines. Italy, most notably influenced the dry-cured ham, similar to prosciutto, called prsut, from the small town of Njegusi. This has a special flavor imparted because of the way the winds sweep over it while the meat while it is drying. 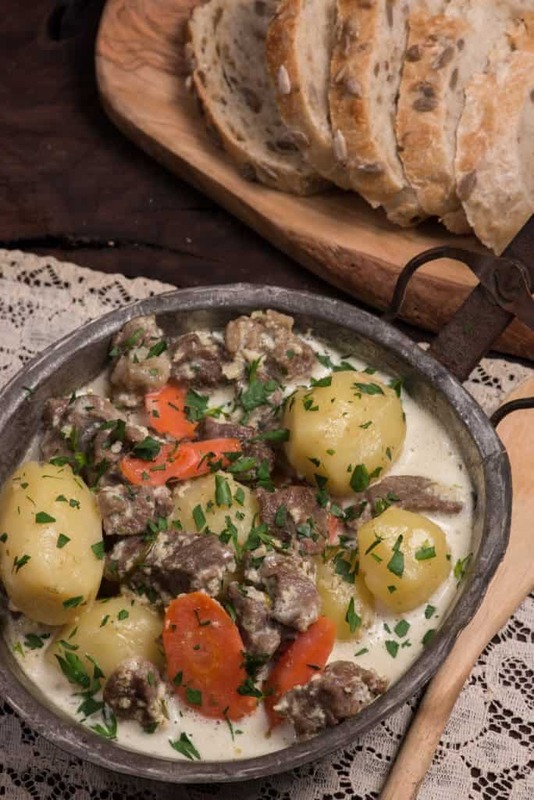 It is considered the national meat of Montenegro. This small town is also known for its soft cheese that goes along perfectly with the prsut. 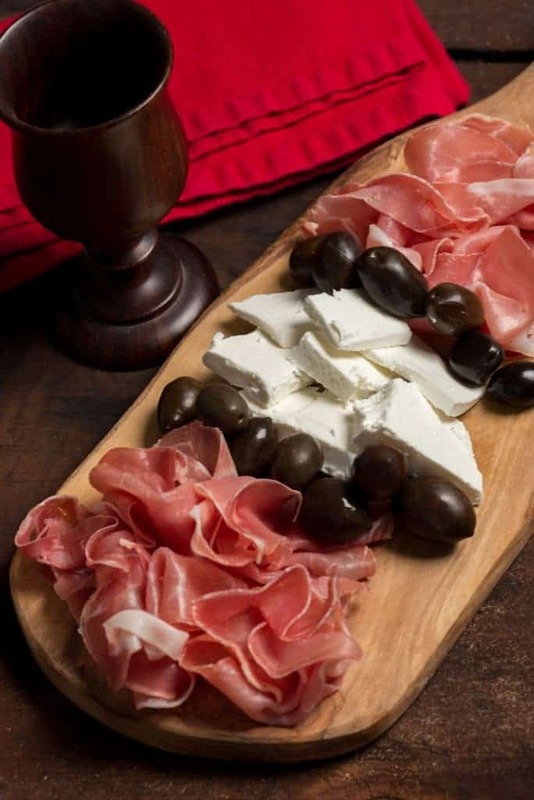 Cheese in oil is another popular treat that goes amazing well with figs, prosciutto and Montenegrin bread. Seafood is popular all along the Adriatic coast, just as it is for its neighbor, Croatia. Black risotto, made with squid ink, is a traditional dish, as is white or red buzara, which we made for our Croatia meal. Grilled octopus is especially popular in salads. Gavice, are small fishes that are floured and then fried and served headless, as a snack along the seaside. They also have a unique way of drying fish, known as fresh air and sunshine drying. After the fish are scaled, grilled and laid out in the hot sun, they are dipped daily in water from the sea. When the drying process is complete, they are smoked and ready to eat. The delicacy is stored in paper bags. It is especially savored in winter when it is boiled and served with vegetables. For the meat eaters, there are many choices; minced meats called cevapi, which are shaped like sausages and pljeskavica, which are shaped like burgers but are known to be humongous. The most popular meat dish however is called sac. The meat can be goat, veal or lamb and is slow roasted in ashes under an iron dome. It is the cooking method that makes the meat especially tender. The meat is often served alongside vegetables that are cooked with it, like potatoes and carrots. Meat is often prepared with the use of kaimac; a cheese that is made from sheep’s milk and makes the meat very juicy and tender. Another unique culinary technique is the way they sometimes cook chicken. They salt a whole chicken and then place it into the body cavity of a lamb, which is roasted on a turnspit. The chicken will also roast and be infused with the flavor of the lamb. Some say it is the best chicken ever. You may want to enjoy your meal with some spirits. Wine is especially popular. Their red is made from the vranac grape and krstac is a dry, popular, white wine. Rakia is a grape vodka and loved throughout the region. It has a very high alcohol content, so consume wisely. Niksicko beer has been produced since 1896 and is their most popular. 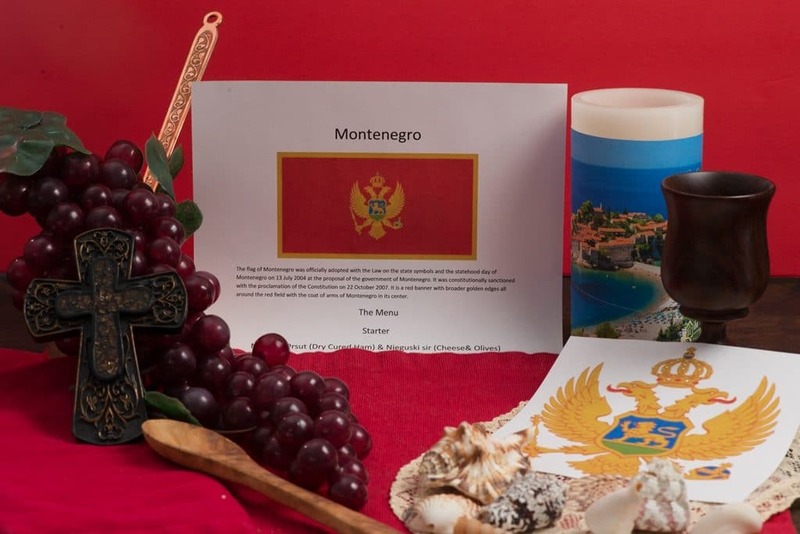 We set the table with the colors of the Montenegrin flag; red and gold. 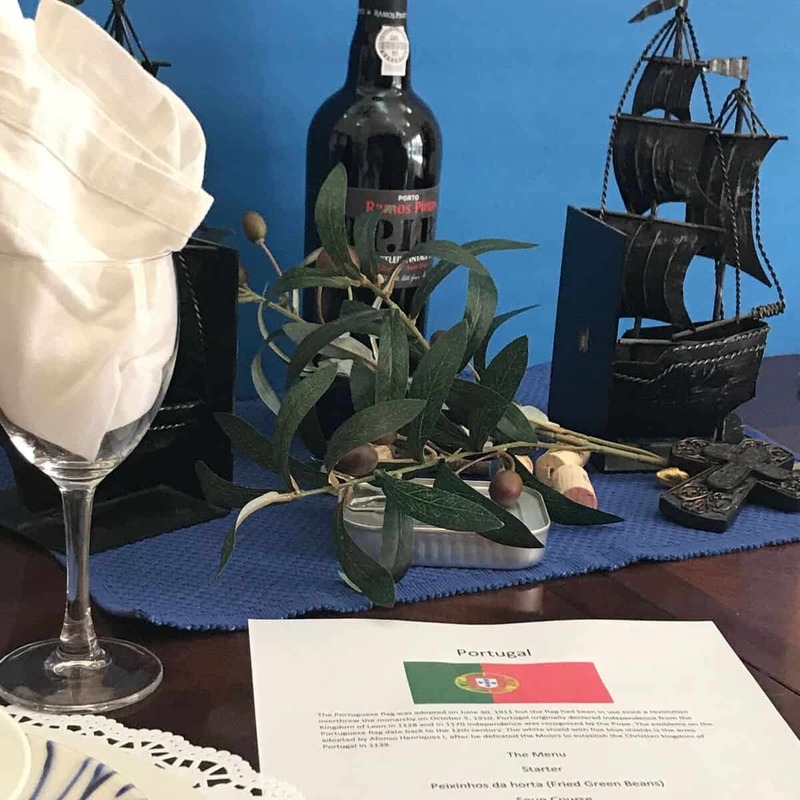 We decorated with sea shells, to represent the Adriatic Sea and also with the two headed eagle; their coat of arms. We began with a toast of red wine and said, “Zivjeli” which is “Cheers” in Montenegrin. Our first course was a chacuterie platter of dry, cured ham, soft brined sheep’s cheese and black olives. This is one of my favorite ways to begin a meal and is popular in many countries. Next was the sopska salad, pronounced “shopska.” This is a very popular salad throughout the Balkans. This version was made with heirloom cherry tomatoes, fresh bell peppers, cucumber and topped with copious amounts of farmer’s cheese. It was dressed with an excellent, extra virgin olive oil and apple cider vinegar. It could easily be a lovely lunch meal on its own with fresh, baked bread and a glass of wine. For the main course, we savored the lamb cooked in milk. The lamb, cooked with hearty root vegetables, was absolutely tender and perfectly seasoned with a touch of fennel seed. (The milk really does work as a wonderful tenderizer.) Garnished with parsley, this was a satisfying and delicious main course. The red wine paired very nicely with the richness of the lamb. 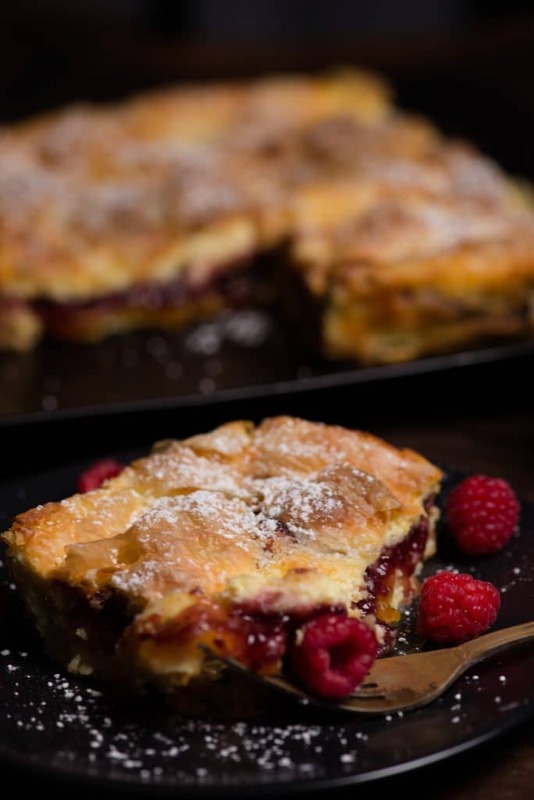 For dessert, gibanica, a rich pastry, with cheese, apricot and raspberry fillings, was served. This is a decadent dessert that was topped with confectioners’ sugar and a few fresh berries. A hot cup of strong coffee was the perfect complement for this dessert. The people of the Balkans are known to be incredibly hospitable. If you are invited to their home, the gate or door will be wide open, in anticipation of your arrival. It would be customary to take a gift, such as a bottle of wine or some chocolates. There is also an unwritten code of chivalry that is the result of its long warrior history. It stipulates that to deserve the true respect of the people, a person has to show virtues of integrity, dignity, humility, self-sacrifice for a just cause, respect for others and bravery. As we say goodbye to this little gem called Montenegro, I leave you with what the English romantic poet, Lord Byron, once said about it. “At the birth of the planet the most beautiful encounter between land and sea must have been on the Montenegrin coast.” This is certainly why an exclusive island area called Sveti Sefan, has been chosen by Sophia Loren, Sylvester Stallone and Queen Elizabeth II, as their “go to” vacation spot. Montenegro’s allure awaits.